Why it’s geek-worthy: iPhone/iPod compatible alarm clocks are becoming much more in demand as the geeks among us try to get a handle on nightstand chords. But after a long research period, I can tell you that while there are many choices for this type of gadget, many of them are sub par. Dual alarms. The number one reason I have strayed from a tradition alarm clock and instead use my iPhone is the ability to set my alarm to only go off on workdays. I love not having to worry about remembering to turn the alarm off for weekends (and back on again). Gradual alarm volume. I think this is a really cool feature that makes waking up much more pleasant. I really disliked the inability to have my iPhone play music or the radio as the alarm. With the Philips speakers, I’ll be able to do just that, and in a less jarring way at that. 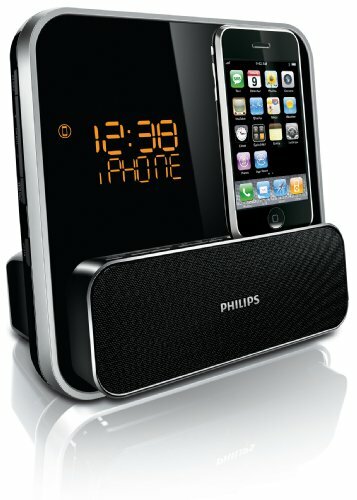 For about $84 on Amazon, this Philips system is sure to be a hit with the iPhone and/or iPod carrying geek in your life!